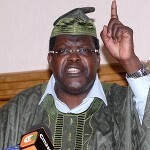 Mr. Miguna, Why shouldn’t Luos be Fixated on State Power? State Power Doesn’t Belong to anyone’s Mother. PHOTOS: Raila’s Journey to China Kicks Off, Nairobi-Kisumu SGR lazima !